Liverpool Football Club is committed to improving your off-the-pitch experience and engagement with the club. Whether you're a season ticket holder from Anfield, someone who can only make it to a few games a year or even a fan from abroad whose only interaction with the club is through this website, it's your input that matters. In order to help reduce queuing times we are trialling the new Seat Serve app in the Lower Main Stand and Upper Anfield Road. The app allows supporters in these areas to pre-order and collect their items from designated pick up points or, if you are sitting in selected seats, you may be able to have your items delivered directly to you. Download the SeatServe app for more information- Anfield.SeatServe.com. Box 1A in the Kenny Dalglish Stand has been operating as a sensory room on a trial basis for a number of games this season. The room is set up with some sensory equipment and allows supporters who have sensory needs such as autism enjoy the game in an environment that is suitable for them away from more crowded areas of the ground. In order to give you more food choices we are trialling Chinese steamed buns in the Main Stand. We are also updating the food & drink signage across the stadium. As part of the Reds Going Green initiative, the club have installed smart meters, utilised LED lighting technology and have improved recycling. Energy efficient hand driers also help to reduce Liverpool Football Clubs carbon footprint. 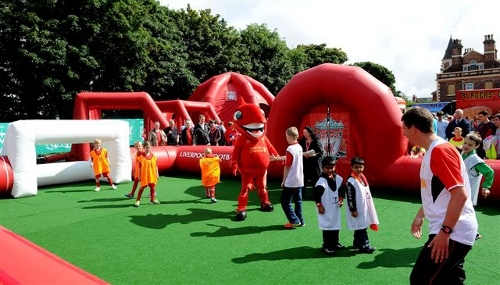 Our Fan Zone Anfield Road introduced more interactive activities for our younger supporters. Our new Fan Zone Paisley Square is now open five hours before kick-off. The area provides fantastic street food and entertainment for fans of all ages. We have increased the variety of beers and spirits that we offer in the catering kiosks within the ground. You said that you wanted more travel options post-match so the club is now working in partnership with Stagecoach to provide a bus service to take supporters back to the city centre after the final whistle. To find out more about the 917 service, click here. Our website is now mobile friendly and our official LFC APP has been updated to provide more Anfield related content on match days. Our Visiting Anfield Guide and Access Guide were updated ahead of Season 16/17. We launched the Anfield Forever project were you can be part of the fabric of Anfield by purchasing your very own personalized engraved granite stone in the new landscaped area of the expanded Stand. For the last two games of the season, we introduced a retail outlet in the Family Zone. The outlet sold accessories and merchandise for our junior supporters. This was well received by supporters in this area and will be available next season. We trialled offering ‘street food’ in the Reds Bar hospitality lounge, which has been well received by supporters. On European games, we opened the Family Park earlier to accommodate for the visiting supporters arriving at Anfield. We now have an ‘Official Opening of the Family Park’ at every home game involving a lucky supporter chosen at random on the day. We have now introduced music throughout all Centenary Stand hospitality lounges to help build up the match day atmosphere. A ‘Bottoms Up’ beer pouring system and ‘fast pour’ queuing lanes have been introduced into areas of the stadium reducing queueing times. Liverpool Football Club's "Family Park" is now open for four hours leading up to kick off on home match days to enable fans to make a full day of their visit to Anfield. Located on Anfield Road, the area provides fantastic food, drinks and entertainment for fans of all ages prior to matches - and adds plenty to the match day experience. Liverpool Football Club has recently launched the official LFC Youth Wristband for young fans to wear on match days at Anfield. The creation of the wristband is to ensure that any child who becomes separated from their parent or guardian can be reunited as quickly as possible. To find out more, click here. Halal food is now available at L4 Kitchen in the Family Park on match days. 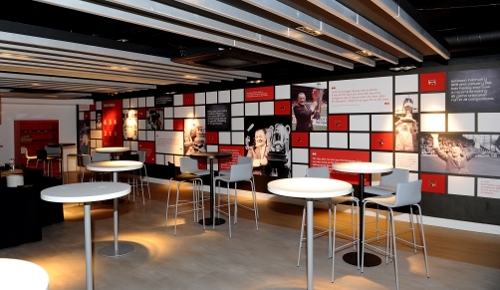 Reds, 7s & 8s Lounges in the Centenary Stand are fully refurbished ahead of the start of the 2015-16 season. The Hospitality Marquee is opened for the 2015-16 season housing temporary hospitality lounges to be used whilst the new Main Stand is under construction. 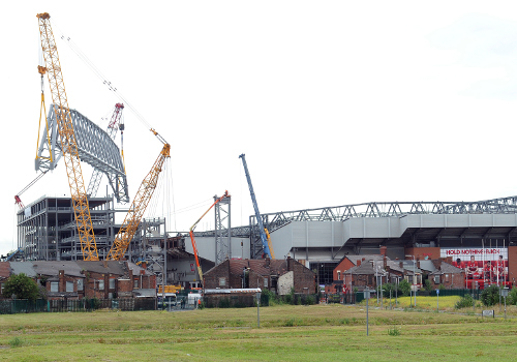 The completion of the redevelopment of Anfield's Main Stand is one step closer after the 650-tonne roof truss was placed over the iconic stadium on July 24. The giant metal structure was carefully eased into place by two of the country's biggest cranes before being secured by expert workers from Carillion, the club's construction partner. Liverpool Football Club has introduced a free cycling hub to encourage fans to cycle to and from Anfield on match days. To read more about this new initiative, please click here. Based on feedback from the Liverpool Football Club Supporter Committee (LFCSC), a 'Ticketing Working Group' has now been created. This involves representatives from fan groups, the LFCSC and the Club itself meeting regularly to discuss important ticketing issues. The LFCSC will continue to post any updates from these meetings via their social media channels. You can follow the LFCSC via twitter @LFCSupCom. Liverpool Football Club's newly installed Changing Places facility has been awarded gold standard - setting the benchmark for other clubs and sporting venues. To read more information on this, please click here. Based on feedback from our fans, in November we trailed the sale of beer tokens in the Lower Centenary and Anfield Road concourses. The token allows fans to collect a beer at half-time from one of the 'express collection points'. This ultimately speeds up the service provided at the kiosks. The trial was a success and we hope to offer this service to fans across the ground in due course. Based on feedback from our fans in Ireland we have now opened a new retail store in Dublin. For more info on the opening of the store, click here. On the day of the Real Madrid game, we ran special 'Champions League' tours. These tours were hosted by Alan Kennedy who gave fans an insight into his experience of playing with the club around Europe. For more info on our future tours, click here. The PA system in the lower Anfield Road concourse has recently received an upgrade. New amplifiers have been added to improve the quality of sound. We have introduced a new canopy at the Centenary stand reception. This enhances the overall look of the area and also ensures that our fans don't get wet when entering the stand. After receiving some great feedback on our 'Carragher' themed food kiosk located in the lower Anfield road stand last month, we decided to upgrade more of our kiosks across the ground. Gerrard themed kiosk - located lower KOP concourse. Liverpool's great number 9's themed kiosk -located lower KOP concourse. Shankly themed kiosk -located in external KOP area by the ticket office. Didi Hamann themed kiosk -located in the lower Centenary concourse. This month, we have finished the final touches to the new 'Carragher' themed catering kiosk located on the lower Anfield road concourse. The idea behind the themed kiosk is to give supporters a recognisable point for them to get to and meet with others at the match. It will also give supporters some interesting images and facts to view whilst waiting to be served. The new online retail store has been given a new look for our fans in Japan, Thailand, Indonesia and China. This month we re-launched our hospitality executive shopping service. This service is provided in all hospitality lounges on a match day and offers a large range of products available. This provides our guests with a professional, helpful and friendly service and allows them to shop without leaving their hospitality lounge. New and improved PA system quality will be in place for the 2014-15 season. Improvements have been made to the online ticketing system under 'best available seating' in order to simplify and speed up the booking process. Members can now select the best seats available within a particular stand and our system will search for the best availability. We have also introduced the best alternative seating so if the number of seats you have chosen in a particular area are not available together, the system will now search for the closest area in the stadium to allocate together your chosen number of seats. For more information regarding how to buy a ticket, please click here. Introduction of new ticketing page. You told us that you wanted to see more 'retro' products in our stores. We have recently updated our store website to include more retro products and this is something that we will continue to focus on this season. In the meantime, visit our new site for the current retro products available. The 12th Liverpool FC Supporters' Committee meeting took place this month. For minutes from the meeting, click here. We are always looking at expanding our variety of food offerings, so this month we trialled serving 'bangers and mash' in one of our food outlets in the Family Park. This was well received by the fans and we will continue to review trial different food options throughout the upcoming season. Catering service - the kiosks now offer a more efficient service through introduction of additional tills, support of stewards in queue management and new layout of the kiosks to enhance the speed of service. As the weather gets nicer, our catering kiosks in the Family Park are offering more and more summer treats such as homemade ice cream and an array of locally produced cakes. You have previously told us that you think the club should launch our new kits in a special way. We took that on board and this month, we launched our new kit in a way that no other club has done before! For more details on this, click here. In order to improve your experience within the stadium at the catering kiosks, some kiosks located in the lower Anfield road area have been updated to provide the most up-to-date facilities and one has even had a special make-over. 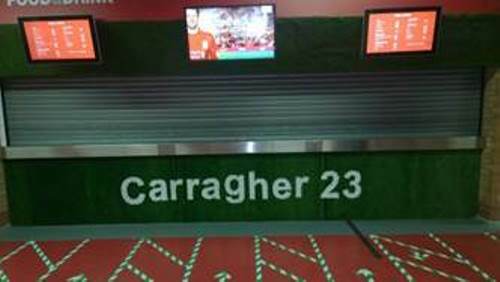 The 23rd catering kiosks in the ground has been renamed 'Carraghers' and displays some of Jamie Carragher's memorabilia. We have also updated our facilities in the visiting section to ensure our visiting fans enjoy their experience at Anfield too. Kiosks in the lower Anfield road area now have modern TV screens which display stats and information about the visiting team. On a match day we understand that some fans arrive early for their match day tour and find themselves having to pass the time until the tour starts. To help with this, our Retail store now opens half an hour early on a Sunday for browsing. The 11th Liverpool FC Supporters' Committee meeting took place this month. For minutes from the meeting, click here. LFC now offer official matchday parking in St Domingo's car park. For more information, click here. Our fan support team will now be available post-match to answer any of your questions or point you in the right direction. The team are easy to spot - they will be located next to a large yellow 'Fan Support' flag in different locations around the stadium. Our catering teams continue to tickle your taste buds with a wide variety of food offerings around the ground. This month we introduced jacket potatoes in the Family Park and pizzas in the Kop, Main Stand and Family Zone. Our official LFC Twitter account now tweets info which you may find useful if attending the match. We provide info on where to park, travel information, in-store deals and update you on any activities taking place in and around the ground. Based on feedback from fans, reduced hospitality packages were offered for the games during the Christmas period. To inject a bit of Christmas spirit into the ground, catering kiosks offered festive delights including mince pies and mulled wine. MCs and live bands were introduced into the hospitality lounges to enhance the matchday experience. 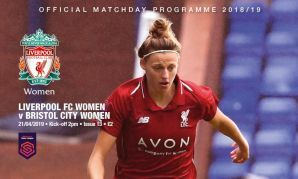 To keep you up to date with any fixture changes, LFC have launched a new webpage which updates information regarding each fixture, including any changes to the time and date of the game. The 10th Liverpool FC Supporters' Committee meeting took place this month. For minutes from the meeting, click here. This month, based on feedback from fans, the LFC Mascot Mighty Red was introduced into the executive lounges on a matchday. This has been well received by fans and Mighty will continue to visit the boxes an hour before kick-off. We introduced new matchday entertainment in the Family Park, including comedian Darren Farley. For more information on Darren, click here. A retail pod selling products designed for our younger LFC fans was introduced into the Family Park. Brendan Rodgers attended the launch of our brand new museum. For more info on the museum and LFC tours, click here. Reduced hospitality packages have been made available for the games which are due to take place during the Christmas season. This is due to feedback from the fans. To speed up the service of hospitality ticket collection, this service is now provided at the ticket office. The Bill Shankly exhibition has been set up at the Boot Room Sports Cafe whilst the museum is closed for renovation. All disabled supporters toilets have been fully refurbished to meet accessibility needs. A 'Visiting Anfield' guide is now available on our website providing useful information on visiting the ground - how to get to Anfield, things to do in and around the stadium. The guide is availableonline or in a printable PDF version. Further to the success of the Family Park in season 2012-13 and the winning of the 'Fan Innovation' Visit Football award, the Family Park now includes a rebranded food village area and additional activities to enhance the matchday experience. To further enhance the matchday experience a dedicated 'Fan Support team' is on hand to provide information and assistance with stadium access. Our LFC website has now been updated to enable you to purchase tickets online via your smart phone. The new hospitality online booking pages went live in July. For more info, click here. Based on feedback from customers, the LFC Help page now focuses on the top FAQS in each category and also includes details of fixture changes. A supporters' committee meeting took place during June. The meeting minutes are available here. A new hospitality website has been launched which should make booking and managing your hospitality tickets easier. The LFC Help page has been redesigned to make it more customer friendly and easy to use. To view our help page please click here. 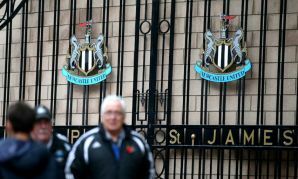 This year the club extended the period of time that fans could renew their seasonal membership cards. Fan feedback told us that you wanted to ensure that Jamie Carragher's last game was an unforgettable one and we hope we made it as memorable as possible. Before kick-off, a mosaic of Jamie's face was revealed in the Kop stand and after the game an interview with the LFC legend was held on the pitch. To ensure that fans are getting the most out of their time in the ground, new photo opportunities have been placed around the ground. All accessible toilets have been given a makeover to comply with UK stadium regulations. New 'Accessibility' signage has been placed around the ground to ensure signs are clear and visible. Updates have been made to the 'Accessibility' webpage and new 'Accessibility' FAQs were added to our help page. Further to feedback from fans, new mobile tables have been introduced in the lower Kop concourse. These tables provide an area for fans to rest their food/drinks and also contain a waste bin in the centre. John Aldridge was in the Family Park at the Swansea game (February 17)) to have pictures taken with fans as part of a 'Barclays Pingit' promotion. Further to feedback from fans and members of LFC's Supporters' Committee, LFC's accessibility pages online have been updated to reflect more up-to-date terminology. A Supporters' Committee meeting took place this month. Minutes from the meeting are available online here. Further to feedback from fans, the travel information on the 'Getting to Anfield' page has been updated to include taxi fares to and from the ground. An all-new match day only 'Bootroom kiosk' opened. 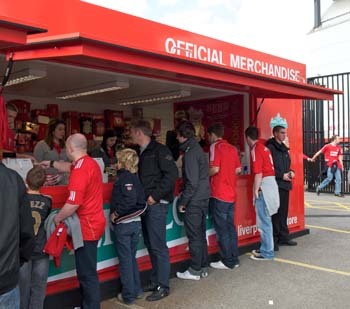 The kiosk is located next to the ticket office Kop stand. For Christmas, fans enjoyed a festivity themed day at the Family Park including mince pies, chocolate giveaways, rodeo activity and a performance from the All Saint Junior School Choir. 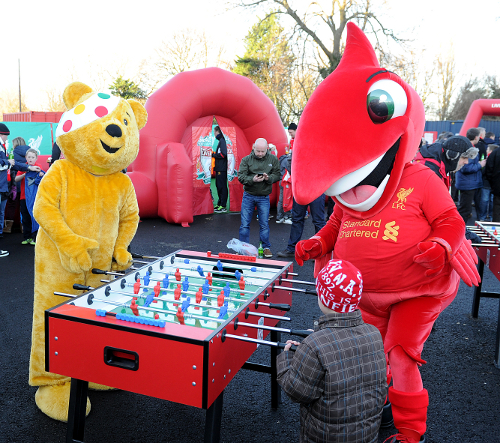 Pudsey Bear joined Mighty Red at the Family Park to help raise funds for Children in Need. Further to suggestions made by the LFC Supporters' Committee, a ticketing guide entitled 'How to Buy Tickets' has been published online. This guide is located on the ticketing main page and provides useful information on how all fans can purchase tickets for the game. To view the page, click here. 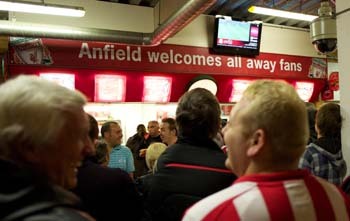 A Supporters' Committee meeting was held at Anfield. For the meeting minutes please click here. Enhancements made to the logging in section of the membership page based on feedback from fans. LFC website launches a new 'Fan Pic' which is a 360 degree photo taken at each home game. Fans can tag themselves in the pic. LFC stewards win the 'Warm Welcome Award'. Liverpool are one of four Barclays Premier League clubs to receive an award for the quality of their customer care as part of a national scheme that is improving standards of fan experience at football stadia. Launch of the Family Park. The Family Park is located next to the Food Village just off Anfield Road. 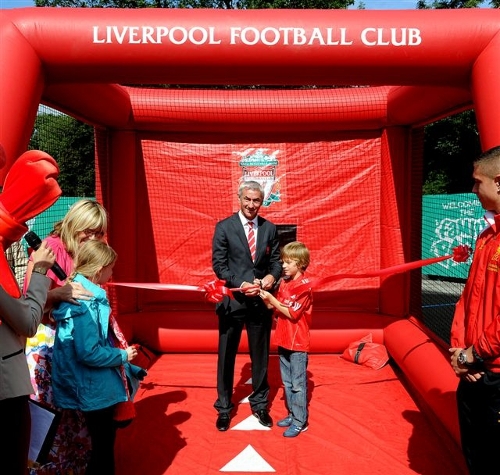 It was opened by Ian Rush with help from LFC Supporters' Committee representative Janet Brown OBE, LFC's Operations Director Andrew Parkinson, and a junior VIP. 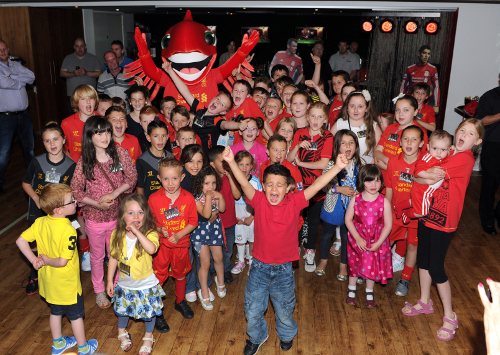 Liverpool FC mascot Mighty Red was also there to entertain the kids. The Family Park will be open pre-match for families who have a match day ticket, and will have a range of entertainment to keep youngsters occupied. This includes a speed cage, a target cage and an inflatable five-a-side pitch. To find out more about the Family Park click here. Re-branding of the adult and child seating area. The Family Zone is a designated family friendly area located at the Anfield Road Upper tier on match days. The adult and child section aims to engage, interact and share the history of the club with families while ensuring their match day experience is one to remember. Further method for customers to contact the club. Introduction of a help twitter account @LFC_Help and extended 'live chat' hours . The opening hours are 9am-3pm BST. Club represented at the UK Pride event in Liverpool. First legends day/tour of Anfield. 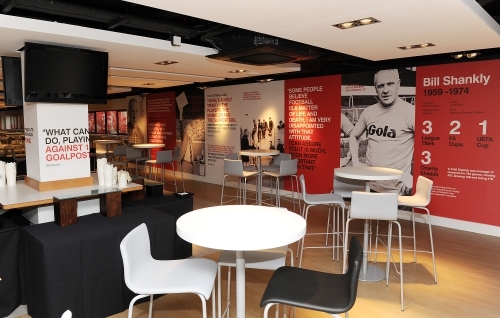 Refurbishment of the Bob Paisley and Bill Shankly hospitality suits in the Centenary Stand as well as the international suit in the Main Stand. Tickets for the over 65s and adult and child now available to purchase online. Launch of Liverpool FC mascot Mighty Red. Fifty lucky winners received a golden ticket to attend the event in the Boot Room restaurant in Anfield. The character of Mighty Red designed to support junior fan engagement. Following the launch, Mighty Red attended Alder Hey children's hospital and various local schools. He also accompanied the team on the summer tour to the USA. New signage placed around the stadium for clearer and cleaner look and feel. Enhancements made to the membership package through consultancy with fans. Announced ticket price freeze for season 2012-13. Introduction of match day tours. Introduction of a dedicated sale day for adult and child tickets. Began the process of transparency in assessing the season ticket waiting list and contacting customers on the list. Liverpool Football Club's Supporters' Committee held its second meeting with prinicpal owner John Henry and club executives prior to the Swansea City clash. 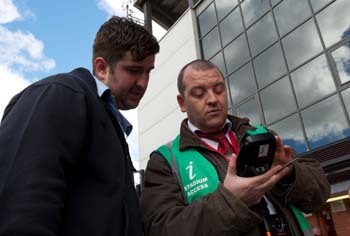 Barcode paper tickets introduced in all areas of the ground, speeding up the entry process into Anfield for supporters. Principal owner John Henry, chairman Tom Werner, managing director Ian Ayre and other club staff met for the first time with the newly formed Liverpool FC Supporters' Committe. Family activities coordinated for the Valencia game. New way of ticket purchasing went live - allowing the first half of the season games to be purchased. 'First Time To Anfield' page created. Season ticket waiting list project - resulted in 2000 more season ticket allocation. Liverpool Football Club announced the 18 people who will make up the brand new LFC Supporters' Committee. A seven-person selection panel featuring Ian Ayre, Ian Callaghan, Karen Gill (Bill Shankly's granddaughter), Dave Boyle, Sue Johnson, Jack Stopforth and John Bishop was drawn up to review every application and jointly agree on the best 18 candidates for the committee. Screening of away games at the Boot Room Cafe - selected games will be available to watch at the cafe. We have advertised accordingly on the offical website for the attention of all customers. This was raised at a recent supporters' focus group and it's great to see that this is now implemented as a result of both the club initiative and on the back of our fans suggestions. Liverpool FC has began a process to consolidate and clean up the season ticket waiting list with the hope to inform supporters of their position on the list before the summer. 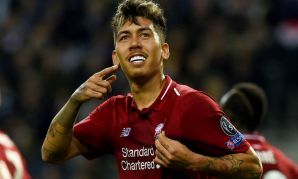 Liverpool Football Club announced the launch of the Liverpool Supporters' Committee that it hopes will allow fans to help shape the club's future through regular and constructive dialogue with senior LFC officials. The committee will be made up of 17 supporters - each representing different groups - with the chosen representatives selected by a seven-strong panel. In a first for LFC TV, new owners John Henry and Tom Werner were joined by commercial director Ian Ayre to take supporters' calls in a live question and answer session on the club channel, giving fans from all over the world the chance to interact with key figures at Anfield like never before. New Bootroom Sports Cafe restaurant opened inside the Kop to give fans somewhere to eat and drink when visiting the stadium throughout the week. Secure parking in the Centenary Stand allows families to park safely before enjoying a meal inside the stadium. New mobile store opened outside the ticket office to help serve customers quicker. The 'match day pod' has five tills and a number of shirt printing units. Free weekly audio podcasts released for fans to download. Over 65s rate for membership tickets. 3000 more tickets available to members. Improvements to the speed of the website following feedback from the new website review survey. Detailed itinerary provided upon registering for Soccer Schools course. Improved interior decoration for increased atmosphere at Soccer School. Ability to make LFC Tour and Museum bookings through local hotels and tourist information centres. Removal of paper receipt for match day tickets. New PDA machines - reduces waiting time for queries. 'Queue busting' outside the ticket office to reduce waiting time for fans. Website homepage redesigned to have more content and less adverts. Feedback tool - emails sent after all visits to improve experience. Retail customer focus group session held with a number of our fans. Implementation of metapack: gives customers the chance to track their own order as an automated email is sent on dispatch. Implementation of metapack: dispatch times have been improved dramatically (95 per cent of all orders are dispatched within seven days). Research prompted a full launch of Match Editor service in e-Season Ticket, allowing fans to easily view key video moments from recent games. Creation of an email newsletter for e-Season Ticket holders to advise on recent content. An additional five kiosks selling draught beer. New website launched following consultation (surveys and user groups) with fans. Launch of the first LFC iPhone content application (Match & News Centre) and player specific versions of the 'Keepy Up King' game following requests from fans. Hawking of beer, hot food, soft drinks and confectionary into concourse areas. 'Waiter Service' introduced to disabled section. New and more interactive tours (script devised by highly acclaimed script writer Dave Kirby). More frequent stadium tours running every 15 minutes. Flash format video added to e-Season Ticket in order to simplify and improve the viewing experience following fan requests. 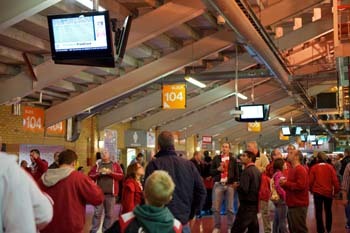 TVs introduced to concourse areas. Vending machines sited throughout the ground. Food village introduced on Anfield Road. Kids' kiosk added on child/adult section. Introduction of customer comment cards/email feedback requests on match by match basis in hospitality. Mobile food carts in the upper Kop and upper Main Stand concourses. Healthier food options ie wraps, sandwiches introduced. Signage welcoming away fans above the away end kiosk. Introduced pre-orders for new kit launches in store and the facility to post them out direct to the customers. New Liverpool FC Online store with improved navigation and reduced checkout patch.